Have difficulty understanding the difference between the visa validity and the length of time you have permission to remain in Romania? This information is for you! The VISA VALIDITY-means the time between the first day and the last day you can use your visa to entry into Romania( maximum 6 months calculated from the date of your first entry into the country). The LENGTH OF TIME YOU HAVE PERMISSION TO REMAIN IN ROMANIA is shown on the visa by the number of days written along with the symbol of the visa and the number of entries you are entitled to. c. 5 days from the entry date, with no possibility of extension in the country, in the case of transit visas. Depending on how many days are written on your visa, you will determine your authorized length of stay in Romania. The LENGTH OF TIME YOU HAVE PERMISSION TO REMAIN IN ROMANIA, according to your visa, will be taken into account starting with the date of the first entry. Overstaying your visa is never a reasonable option and should be avoided if at all possible. Entrance from-means the first day you can use your visa to entry into Romania.It has nothing to do with the day you start calculate the length of your stay in Romania, unless you actually enter Romania this same day. Entrance until-means the last day you can use your visa to entry into Romania. It has nothing to do with how long you can stay in Romania. D-is the symbol of the long term stay visa. Depending on the purpose for which they are issued, visas may be identified also by the symbol A– visa for airport transit, the symbol B– for other transit visa or by the symbol C– for the short stay visa. M-means that you can entry into Romania multiple times during the visa validity period. If instead of the letter M you have the letter S written on your visa, it means that you can entry into Romania only one time. 90-means how many days you can stay in Romania;The period of residence will be taken into account starting with the date of the first entry. Name & Surname-check that your name is spelled correctly. 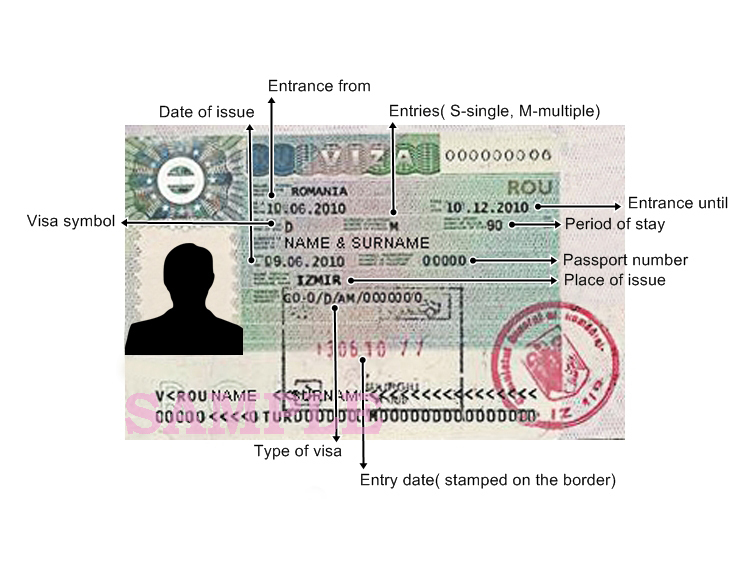 Date of issue-means the date when a consular officer at a Romanian Embassy or Consulate abroad has determined that you are eligible to seek entry for that specific purpose and issued the visa on your name. Passport number-check that your passport number is correct. Entry date– means the first day you entered Romania.From this day on you should start to calculate the number of days that you are allowed to stay in Romania.